The PI's Perspective: Share the News - The Farthest Exploration of Worlds in History is Beginning! Spend your New Year's Eve with NASA, as New Horizons conducts the first close-up exploration of any Kuiper Belt object and the farthest exploration of any worlds in space ever attempted — more than 4 billion miles from Earth and a billion miles beyond Pluto! 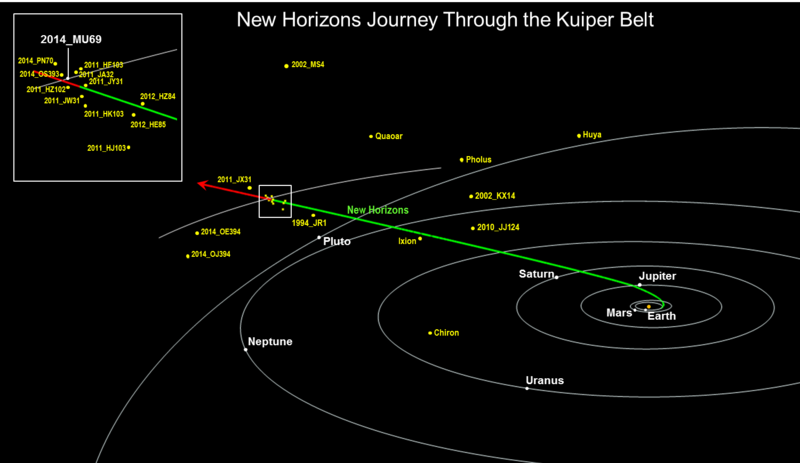 The New Horizons spacecraft is healthy and is now beginning its final approach to explore Ultima Thule — our first Kuiper Belt object (KBO) flyby target — about a billion miles beyond Pluto. And on New Year's Eve and New Year's Day, New Horizons will swoop three times closer to "Ultima" than we flew past Pluto three years ago! As someone who follows New Horizons, let your friends and social media followers know about the upcoming exploration of Ultima and that New Horizons and NASA will make history at the holidays with this epic exploration. There are many ways to follow New Horizons and its unprecedented exploration of the KBO Ultima Thule—from websites to NASA TV to social media to press articles! This beautiful artist's conception of Ultima was created by Roman Tkachenko. Ultima is 100 times smaller than Pluto, but its scientific value is incalculable. From everything we know, it was formed 4.5 or 4.6 billion years ago, 4 billion miles from the Sun. It's been stored at that enormous distance from the Sun, at a temperature of nearly absolute zero, ever since, so it likely represents the best sample of the ancient solar nebula ever studied. Nothing like it has ever been explored. Its geology and composition should teach us a lot about how these building blocks of small planets like Pluto were formed. The New Horizons mission team is excited too, and we can't wait to see what we will find! Will Ultima be an agglomeration of still smaller bodies formed at the birth of the solar system? Will it have an atmosphere? Will it have rings? Will it have moons? Any of that could be possible, and soon we'll know the answers to these questions. So come along with New Horizons, spend your Christmas in the Kuiper Belt and your New Year's with NASA – and join us for the Ultima flyby. Until then, I hope you'll always keep exploring — just as we do! There are many ways to follow New Horizons news and commentary on social media! You can find others by searching on the Web.